Do you want to learn more about the newest Disney Resort located in Hawai'i? Tune in to ABC to see Aulani, A Disney Resort & Spa, on not one, but 2 different ABC programs. "LIVE! With Kelly" is currently taping at Aulani. These episodes will air next week, Feb. 20-24 (check your local listings for details), and offer beautiful views of the Resort. 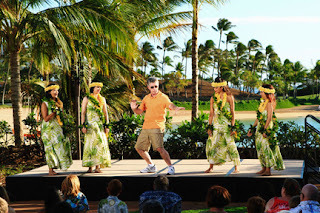 "America’s Funniest Videos" also recently filmed several episodes at Aulani. "AFV" host Tom Bergeron took time during the shoot to slide down Tubestone Curl into Waikolohe Stream and joined the dancers of the “Starlit Hui.” (pictured above) These episodes of "America’s Funniest Videos" will air on May 6 & 13 on ABC. Ready To Visit Aulani In Person? If you are ready to visit Aulani in person then contact Only WDWorld Travel to book your vacation or to get more information.